Google Sites lets you easily create, update and collaborate on your own site - no technical know-how required. 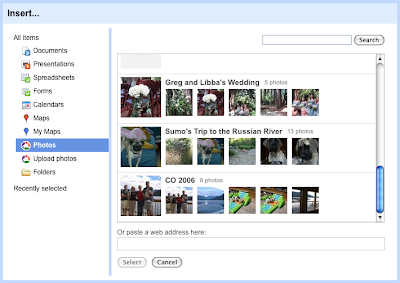 And now you can easily add photos from your Picasa Web Albums to your sites, instead of having to manually upload photos from your computer. Whether you're using Google Sites to keep friends and family updated on your life or to manage a team or project, adding photos can give your site a lift. The 'Insert' menu in Google Sites now includes an option to insert an existing Picasa Web Albums photo or to upload new photos. Never used Google Sites? Learn more or sign up now.